Home » Shirt Design Reveal! You voted and the results are in! 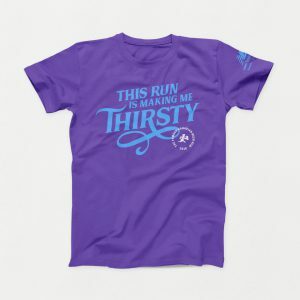 This year’s shirt design will feature the saying “This Run is Making Me Thirsty” – which we’re pretty sure you’ll love wearing all year long! Oh, and as a bonus there will be NO logos on the back…so you can wear it around town without looking like a dork. You’re welcome. Pick yours up at registration! Just Two Wave Starts Left!